"There are times when you just know that something special is happening. The Self-Transcendence 6 and 10 day race is just a few hours old and already 36 year old Igor Mudryk from Vinnitsa Ukraine seems to be doing something above and beyond everyone else in the field . 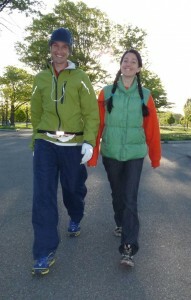 . . " Illumining and inspiring stories about our pioneer runners and enthusiastic staff. Post-Race Comments by Runners and Staff. 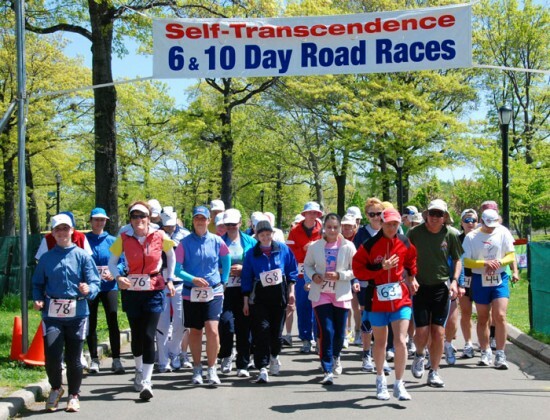 The Sri Chinmoy Marathon Team is proud to sponsor the 15th Annual Self-Transcendence Ten Day Race. These races feature an international field of runners who come to test their endurance, skill with pacing, and ability to recover from the stress of constantly moving. 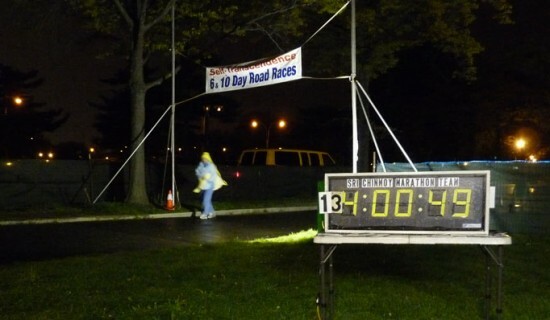 The competitors run with minimal sleep, all the while trying to accumulate as many miles as possible. 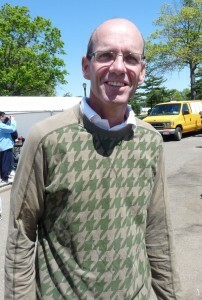 The course is a very flat, scenic, 1 mile loop in a pleasant park setting near the famous areas of the World’s Fair of 1964 and close to the USTA facility, home of the US Open. There are many patches of green and trees, as well as close proximity to Meadow Lake. Temperatures in April in New York generally vary between 52º and 71º with extremes at 33º and 90º. In other words, plan for any conceivable weather condition, including rain and windy conditions. With several very talented and creative photographers on site for the duration of the race, we will be posting daily their inspiring and insightful images. See how your friends are doing as these artist paint a wide range of pictures with their cameras. And, if a picture is worth a thousand words, then by the end of the race we should have a whole library of amazing images! 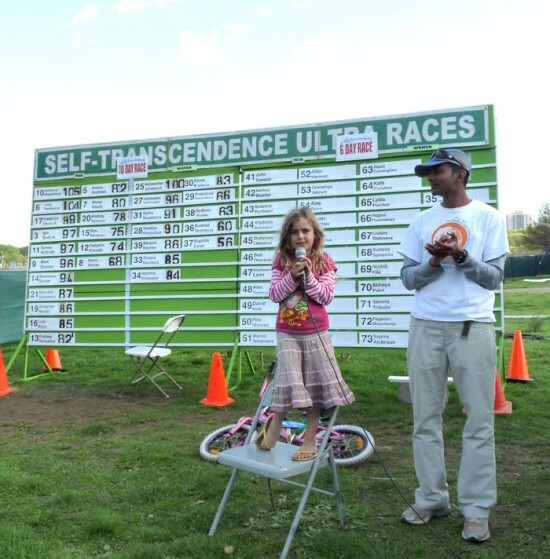 This race is held concurrently with The Self Transcendence 6 Day Race for 2010. No, no, no! It is not that I was running10 days in paradise! On the contrary, many hours were physically and mentally very hard work. No, no, no! 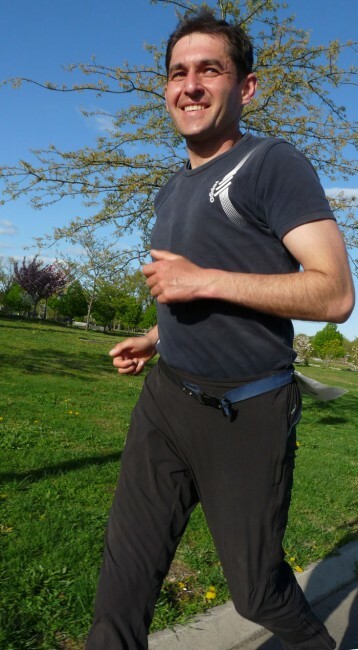 This is not 10 days of vacation from work with easy jogging in a nice park. On the contrary, several of the 75 runners, already on day 2 or 3, would have probably preferred to be at work than at Flushing Meadows Park. Soon after the start you realize the dimension of the endeavor. You realize that you are in for a multilevel experience where every aspect of your being from body to soul is involved. Experiences on different levels often follow each other in almost breathtaking cadence. 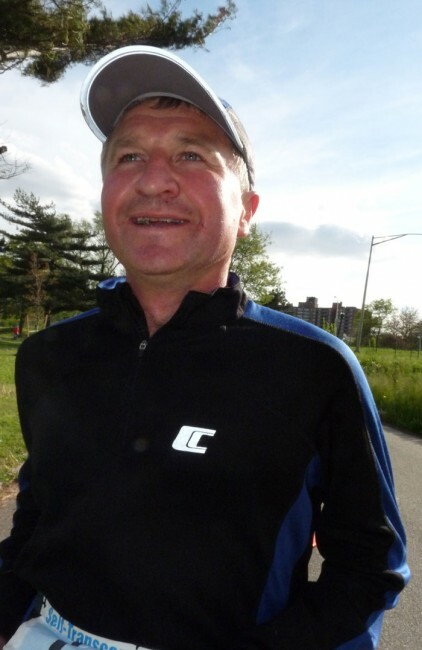 The experienced old-timers like Stutisheel Lebedyev call this “the real fullness of life” and he adds immediately that he find this fullness nowhere as tangible as in these multiday races. 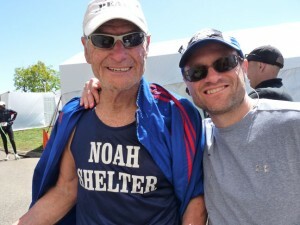 Don Winkley, the oldest participant at 72 years, always had an uplifting story from his many years of ultrarunning, and calls the difficult moments “the character building miles”. I definitely had many of these – time will tell whether my character reaped the benefits of them. One thing is sure: these races expand your capacities - physical and mental. Who would believe that at fifty you can run 531 miles or 850km in 10 days. And other runners did more than that. But it is also qualities like faith, perseverance, determination, patience, cheerfulness, inner focus and balance among others that are constantly trained and expanded. You are learning about your limits and you are trying to find ways to push the limits further or to go beyond them. In this “self-transcendence” lies one of the main goals of the race and also one of the main joys and fulfillment. Carl Lewis once said: "believe me, the joy that comes from 'going beyond' is the most incredible feeling in the world…" The ultimate joy comes from performing one’s absolute best, no matter one’s order of finish. I believe this statement by the legendary sprinter proofs also true for most of the participants in these ultra long distance races. And then there are those magic moments when you unmistakably feel the close presence of your teacher, you experience the “perfect” running, the movement, the speed, the strength. 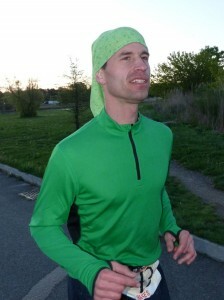 If this running flow continuous it may develop into a kind of a trance where you do mile after mile almost effortlessly. Or suddenly you are running together with someone on the same speed and a team has been born. The teamwork may be only running together in silence, with a deeper inner understanding or you may chat along as the miles go by. For me the best experience was on day 5 which was also the start of the 6 day race. It was a beautiful day, no cloud in the sky, absolutely perfect. At some point in the morning while listening to some devotional kirtan music on my Ipod, suddenly my whole perception changed. I saw not only the few meters in front of me but I looked up and saw the whole course with all the runners. 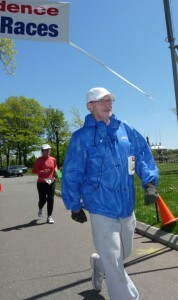 I felt the tremendous aspiration of all the runners and I felt absolutely one with it. I also saw and felt nature around the course as never before. The different trees, the leaves, the grass, the lake, the birds, with all the creation there seemed to be a direct connection or oneness. It was emotionally overwhelming and tears of gratitude were flowing. This moments in paradise lasted for several hours and it was clear that for that experience alone it was worth to have done the race. The real challenge of the race came with the following days and strong long lasting rains that flooded many parts of the course and that at certain parts brought up associations with the legendary “Woodstock Festival” where rain turned everything into mud. There were times when it felt like an epic battle against the elements. Later, a very strong wind, further challenged body and mind and when you add the permanent traffic and noise from the 3 surrounding highways and close-by La Guardia airport then you can imagine the difficulty of the conditions. “Keep moving”, told me Louis Rios - another old timer, is the secret of most of the great ultrarunners and this is what you have to remember in these moments. There was definitely something of a heroic spirit in the air. In the end there is a deep feeling of accomplishment and gratitude. 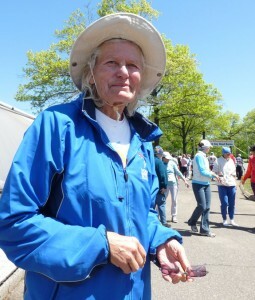 Gratitude also to the organizers, the Sri Chinmoy Marathon Team, and the many volunteers that spend days and nights at the race to make it happen. Good afternoon, and welcome to the awards presentation of the 15th Annual Ten Day and 13th Annual 6 Day Race. just right. Plus, no one in New York knows about this race, other than a few thousand likeminded devotees around the world who are also capable of doing races beyond the marathon distance. So what is this race about. Runners sleep in tents or in big dormitories on cots or on the floor like refugees. They eat food and keep moving at the same time. They go round and round and round for hours, days, a week even, on the same flooded, perilous coarse. They run morning, noon, night, after midnight, 4;00 am, just about anytime. There is no prize money. there is no financial incentive. There is no logic to this behavior. That is the point. They do this because they love, and they care. They care about movement, they love being better. They care about support, and love to help their own competitors. So then, this race is not just a competition. It is an inspiration. It might be tough, but its symbolic goal is parallel with the deeper, farther Goal- a life of Real Satisfaction, of Real Understanding, A life of Self-transcendence not only in oneʼs life but always, in all Life. Athletics has a way of helping an individual to reach his potential not only in the physical realm, but with many of lifeʼs endeavors. But extreme athletics has done more to help the athlete in the inner world. So it is with this race. Dear Runners, you have shown us that dredging rains and blasting winds cannot stop you, cannot postpone your date with a better tomorrow, due to your self-determination and oneness. We thank you for all your performances and wish you Joy, happiness and peace-Inner and outer peace from your efforts. And the last person to thank, but not the least, is Guru Sri Chinmoy. He single-handedly pushed us to offer these races for the public when they were seedlings or saplings. 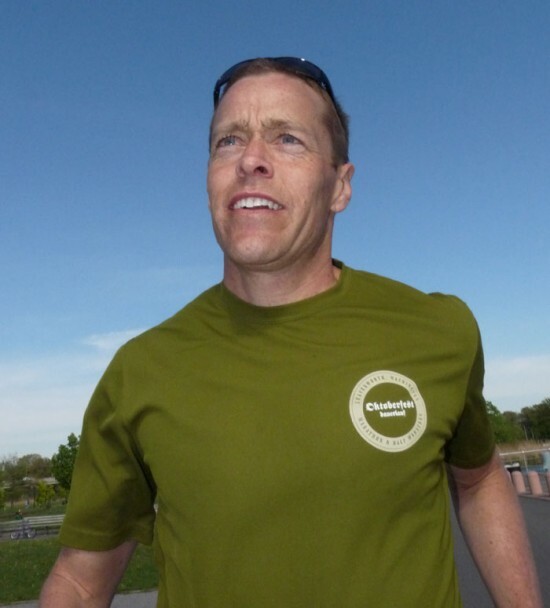 He has given us the concern and oneness needed to help and inspire the runners to reach their goal, if not their potential, in the running world. Thank you, Guru, for allowing us to offer 105 multidfays here in New York the last 25 years! 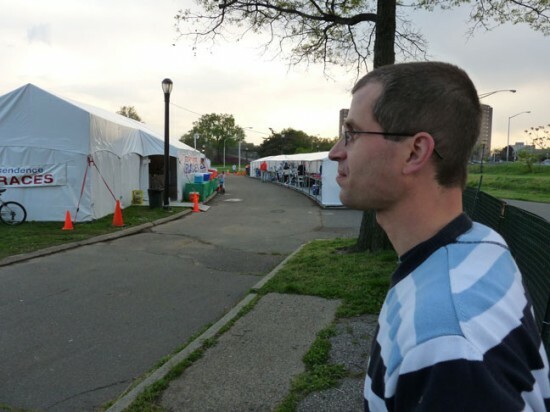 This year's Self-Transcendence 6 and 10 Day Races in New York's Flushing Meadows-Corona Park are over, but in my heart and dreams they continue...I am currently washing two week's worth of dirty laundry and chasing my kids around the yard. A longer report is forthcoming, and hopefully should appear in ULTRARUNNING magazine, on multidays.com, and in ULTRARUNNING WORLD ( European ultra magazine). I wore out/trashed four pairs of Asics DS Trainers (2010 model), two my normal size 11.5, two size 12. I also finished off a pair of adidas adizero aces (this in a mere 520 miles of running). Note that those shoes all weigh less than 10.8 ounces in size 11.5 according to my scale. I had a pair of adidas supernovas (heavier, 12 ounces), but they were too stiff and hurt my feet after two miles. I wear all these shoes in training and in trail races too. Generally, I have trained and raced in lighter shoes for the past 39 years--but that's just me. This was the first race in my life (200+ ultras, and an additional 800+ races dating back to 1971) where I have had a shoe sucked off my foot by aggressive mud! And this was a "road" race. Suffice it to say the south little loop along Meadow Lake was a mudbowl, and also featured ankle deep ice water and floating foot bridges at times. Once again I am in AWE of the work put in by The Sri Chinmoy Marathon Team. Without the expert medical help of Dr. Meghabhuti, chiropractors Mitch, and Garesh, message therapists Yuri and Tomas, Nurse Bahula, I could not have stayed healthy and moving. One European runner and I remarked how some USA runners who were running themselves further and further into injuries still avoided going to the medical tent (European runner to me: "Why Americans don't go to doctor?!" Certainly the worst injuries in the races all befell Americans, and I count my blessings I was not among them. Without the round-the-clock gourmet food cooked up by Nandana Lynn, Sushovita, and Crew, I would have run out of steam (there was never once a shortage of food, even when cold, wet runners crowded the cafeteria grabbing like wild wolves at anything hot and savory). As hard as their running task will be, my friends in the 3100 mile this summer will also get to enjoy the repasts of these wonderful, always-smiling chefs. Also Shakti, Nandana's 8 year old daughter, provided endless energy and entertainment for the runners (one night I swore there was a cardboard box moving slowly across the path--it turned out that a certain 8 year old girl was inside the box playing a joke on tired runners! Ha!). One person in particular whom I feel doesn't always get the credit he deserves is Bipin Larkin, the athlete village architect, lead carpenter/electrician/plumber. He and his small but tireless crew (Pavol, Asankita, Rajpal and others) could be seen out in their heavy yellow fisherman's coveralls in the teeth of the worst storms, pumping out overflows, replacing cones and barrricades, hauling gas canisters and supplies back and forth, fixing leaks -- and seemingly never sleeping. I met Bipin almost 30 (thirty) years ago at a wonderful wintertime marathon he directed along the New Hampshire seacoast (it was cold but less stormy there in February than it was in April this year in Flushing Meadows!). Some folks have asked me how the 10 day was different from the 6 day, and my initial response is -- it was just longer! The last two days in particular dragged for me, and I missed my home and family, but then again the wonderful group of international runners and helpers at the race are like family too. 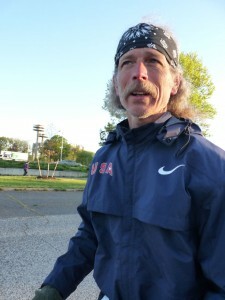 Also, after 40 years of running, racing, my body does not recover from day to day as in my never-tiring youth. One recent list topic I thought about during the race was Yiannis Kouros's opinion thta real ultras--REALLY going beyond the marathon--start at 24 hours. I have run some very tough trail 50kms and 50 miles, BUT must admit I hear what Yiannis is saying. Running for days requires other skills not needed in a shorter ultra. A multiday is doable by anyone with enough determinationb and some decent training, but the ongoing mental battle is different from a race lassting less than 24 hours. I do feel certain "spiritual" and philosophical approached are needed in such an unimagineably long event (see my interview with Utpal Marshall on "Perfection Journey" blogsite). 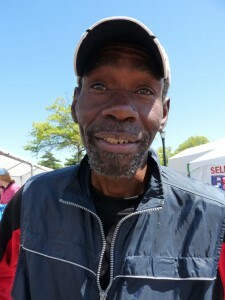 My race ended Thursday at noon, but my next two days in New York were anything but restful. Friday I saw one of my favorite people, Don Winkley,we off (we managed to make it the 1/2 mile to the nearest Holiday Inn Express after the race before both succumbing to deep sleep). Then I drove through heavy traffic into NYC for a walk around Fort Tryon's lovely flower gardens before a fancy outdoorss dinner overlooking the city. Saturday I met old friend Chanakhya Jakovic (now of Slovenia) for brunch at one of my favorite NYC restaurants, The Smile of the Beyond, where race director Sahishnu cooked up fluffy pancakes, eggs, fresh orange juice,...The good food was matched by the good company of many of the runners from the races. Then Dr. Jakovic dragged me all around on a historic walking tour of Jamaica (this included the endless 150th Street hill site of marathons years ago, as well as the 3100 mile loop), before my legs said "enough." Note that Chanakhya and two other runnenrs from the 6/10 day did the weekly 2 mile RACE around Jamaica High School early Saturday!! After buying a sari for my daughter Amalia from "The Divine Robe Supreme" (store could have been in a Harry Potter set), foisting all manner of excess "stuff" on poor Sahishnu (luckily he seems to have a larage garage), buying MORE gifts at the Card Shoppe and wonderful pastries and coffee at The Panorama Cafe (site of many Guiness World records set by Ashrite Furman), and saying emotional goodbyes to my Russian/Ukrainian friends (a bunch of young Ukrainians shared the shelter/dugout I was in with me), I rushed to LaGuardia Airport. Sahishnu Takes a Breath and Summarizes the Races So Far! It might be spring but the Ten Day competition has heated up as Yuri Trostenyuk assumed the lead by four miles after a 69 mile day, over previous leader Volodymyr Hlushchuk. 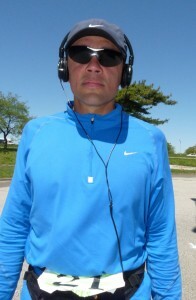 Igor Mudryk, also from the city of Vinnitsa in Ukraine that gives us Yuri T., had the best day with 75 miles. Kaneenika Janakova, the defending women's champ, moved into second overall- only three miles behind the gents.Fred Davis III has been holding onto fourth place for a few days with a strong and consistent running gait. Jayasalini Abramovskikh has remained in second place and matched Kaneenika step for step the last 36 hours, but somehow cannot gain ground on the lanky champion. The cool evenings and sunny, clear days have allowed the runners to stay on track- however, rain looms on the weekend that might carry into most of next week. Another test for our heroes of the pavement- and that is what they expect. Four men are battling for fifth place and higher, as competition is igniting dormant or hidden talents in many of the competitors.And with more than half the race remaining, things are getting interesting. With the addition of the Six Day field igniting the flames of speed and stamina, our heroes of the Ten did glide along with a certain purpose today.Yuri Trostenyuk ran 69 miles to remain in front of the other 28 runners, but his grasp on first is giving way to the onslaught of Igor Mudryk, his friend and compatriot from Ukraine. 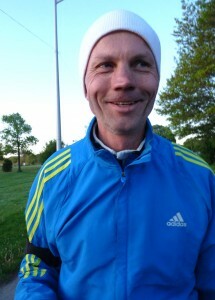 Mr Mudryk sliced his way through tired signs of his own fatigue to garner 74 miles on a sunny,breezy weekend . 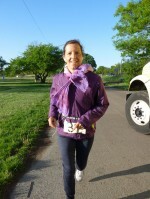 The palpable energy helped Kaneenika Janakova remain far ahead of her competitors with another 69 mile day. She also creeped up to Yuri T.- only 3 miles separate the two leaders of the race. Meanwhile, the start of the Six Day revealed speed in abundance on the men’s side. Newcomer Alex Swenson wisked his tall, thin frame around the loop with precision reaching 108 miles for the first 24 hours. He was four miles clear of American 48-hour record holder John Geesler and seven ahead of twelve-time champion Dipali Cunningham. Dipali is the undisputed Queen of Flushing Meadows. This park is the site of numerous records and overall triumphs by the thin Australian woman, who last year turned 50 but shows no signs of slowing down. The rest of the field did their best to stay close, but with diminishing returns. Swenson and Geesler are speed merchants in a sport of turtles, but also possess stamina and the will to maintain. Dipali, on the other hand, is a relentless runner who always seeks to find new ways to push herself, even without competition. The race for 144 hours should be an intriguing story as it unfolds lap by lap. Stay Tuned!!! Illumining and inspiring stories about our pioneer runners, handlers and staff. 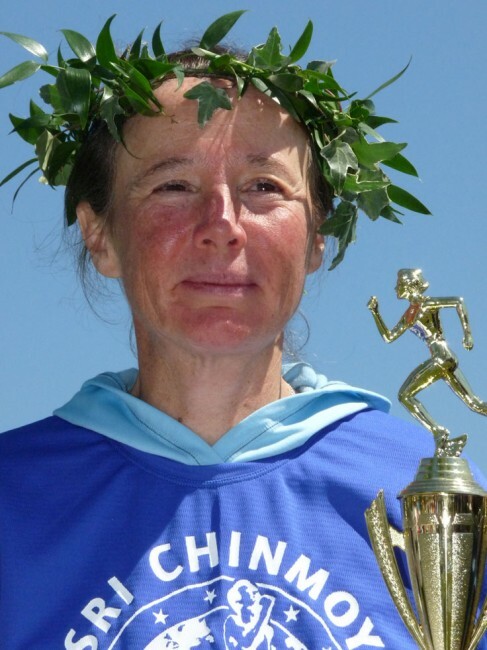 Read about Dipali Cunningham: “It’s not easy to break a world record.” Once long ago Sri Chinmoy told this to Dipali Cunningham as she set one of her many world bests. 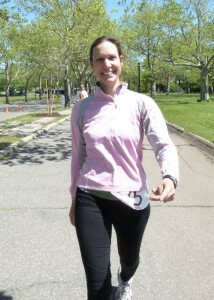 It is also not easy to run 446 miles over 6 days as she did here in Flushing Meadow today. Read about Yuri Trostenyuk: "To me it is an inexplicable mystery that the first 3 men in the 10 day race are not only from the same country, Ukraine, but also that they come from the same small city, Vinnitsa. If that were not enough to make you scratch your head in amazement, there are also 2 other citizens of Vinnitsa in the race...."
Read about Dipali Cunningham: "She is not just the leading woman in the 6 day race, Dipali Cunningham 51 from Melbourne Australia is the leader overall. In so many ways it is this race that is the focus for her of an entire years worth of training..."
What is it like for our runners and staff during the night: "When the sky is bright and the air is fresh and warm it easy to see how and perhaps why 68 runners would choose to be part of this amazing world of self-transcendence running. I am at the race now though in the dwindling seconds of a Saturday night, which in moments, will stride into the even inkier dark wet blackness of a dismal Sunday..."
Read about Alex Swenson: "He is the new kid on the 6 day block, but you would never know it. He is moving easily here around the course on this gorgeous Saturday afternoon without any signs of wear and tear. It is really hard to believe, as he runs so effortlessly now, that he has been at this for more than 24 hours. About Smarana... "The very need to run is a primal aspect of our beings. 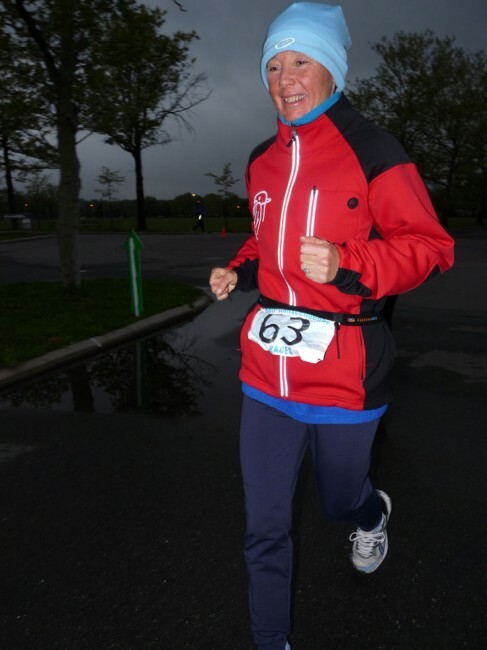 It hearkens back to a long ago ancient time when the ability to run was an integral part of our makeups...."
Six Day Race Start: "At noon time today, the second great wave of runners stepped off from the starting line in Flushing Meadow. There were 40 in total and under bright sunny skies they set off on a journey that will not be completed until 144 hours have passed..."
About our cooks..."The race is heading into its 3rd day now and the sun bright weather of the past 2 days took a decidedly damp turn this afternoon..."
Some opening thoughts on the beginning of the race..."I don’t know what you did last night but I have a good idea what 29 ten day runners in Flushing meadow did. 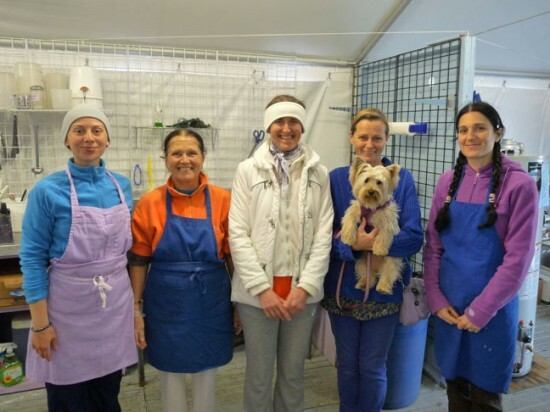 As the warm bright afternoon of their first day settled away and was replaced by a still cool night, the true enormity of their task truly opened up in front of them..."
Read about Igor Mudryk from Vinnitsa Ukraine: "There are times when you just know that something special is happening. The Self-Transcendence 6 and 10 day race is just a few hours old and already 36 year old Igor Mudryk from Vinnitsa Ukraine seems to be doing something above and beyond everyone else in the field. 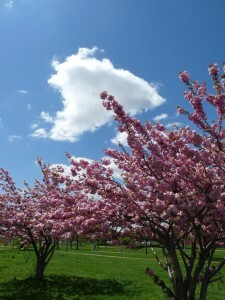 Beautiful Flushing Meadow Park ..."The skies are fresh, bright, and clear over Flushing Meadow today. Below, by the rippling waters of Meadow Lake, the walkers and the gawkers are out and about enjoying an usually early spring. One in which the flowers have emerged much ahead of schedule." 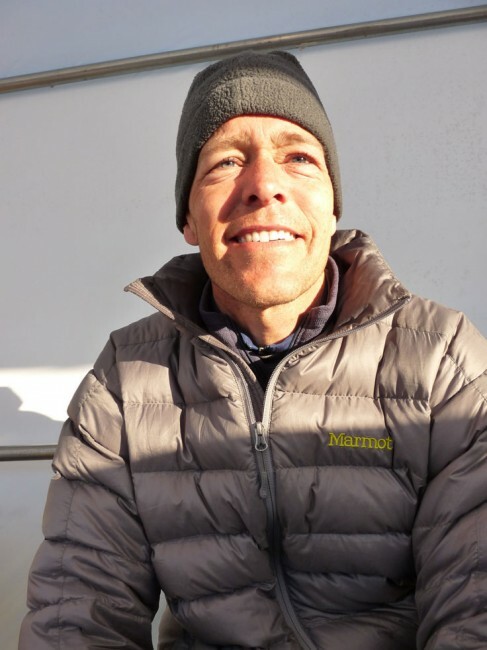 In the companion Six Day, Alex Swenson fromVashon,Washington has the three-day lead with 245 miles, closely followed by Dipali Cunningham, (243 miles)the perennial women’s champion who seeks to win the race overall again. In a bid for the top tiers sit two 3100 mile runners, Vladimir Balatskyy and Smarana Puntigam, both residents of Austria, who remain at 224 miles and 214 miles, respectively. At this point in the race six men and one woman are over 200 miles completed, with less than half the race remaining. With yet another 36 hours of rain expected, our heroes from both races must summon the willpower to continue on and fight the good fight. Yet, the outer race is still in question, the final places yet to be determined.